Whether you’re a teen looking to play the ukulele for the first time, or an adult looking to flex some long-resting creative muscles, the Aurora Cultural Centre’s Educational Programs offer something for everyone. The Centre’s 2018-2019 program is in full swing and offers returning favourites, new spins on the classics, and fresh programs based on requests from the community at large. Expanded for this year are children and youth programs, including the Cultural Centre’s very first after-school program – a Youth Ukulele Class led by Anthony Clayton, a teacher with the York Region District School Board. “We do feedback surveys at the end of every class that we have,” says Leanne Dimonte, Education Coordinator with the Aurora Cultural Centre. “We always ask individuals who have taken previous classes here before what other offerings they would like to see. There were a few people who said they wanted to see after-school programming. I knew I had the right instructor and that is half the battle, especially with children, and is a very unique skillset. You have to have a lot of patience and be able to break things down. On the road to this goal, all of the Cultural Centre’s children’s programming has expanded in length to two hours a session. 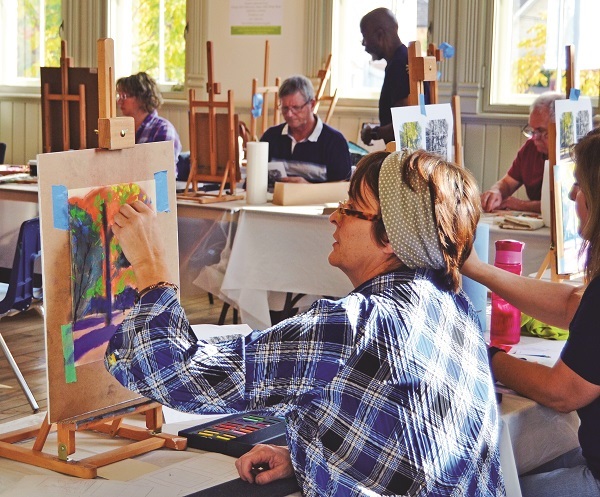 Adults will be able to hone their artistic skills through a number of workshops, including a series run by artist Kathy Marlene Bailey, who will offer courses in glaze oil painting, a new medium introduced locally by the Centre last season. This Saturday, Clarence Porter will lead a one-day workshop on pastels. Local artist Nancy Newman will be on hand October 30 and November 6 to lead a course on painting watercolour birds. Suitable for budding artists aged 16+, participants will leave the course with a watercolour painting of their own, suitable to frame with pride. “These are courses that change season to season and we find that people really gravitate towards them because it can be kind of intimidating to try your hand at an art form and it can also be intimidating to commit to eight weeks,” says Ms. Dimonte on the short courses and one day workshops. “I think if people know this is something they have always wanted to do, they’ll take drawing class for eight weeks, but if it is pastels, something you’ve always heard of and want to try your hand at, you can without having to commit eight Thursdays to it. “Of course, we also have our Open Studio as well every Tuesday from 10 a.m. to 3 p.m. We call it a perfect weekly excuse to get your paints out and meet other visual artists in the community. It’s nice because we have had people who come in and have painted in the past, but they just don’t have the space for it, or it might be kind of messy. We have tabletop easels, you can put the radio on, and it is a nice, free option that we do have each season.